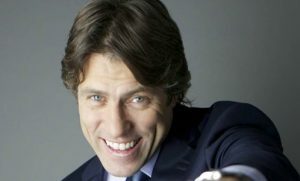 John Bishop has been announced as one of the hosts for The Nightly Show, ITV's new week-night entertainment vehicle. The Liverpool comedian joins already announced hosts, David Walliams and Gordon Ramsay, for the 30-minute daily entertainment show being produced for ITV by Second Act Productions. The Nightly Show will be recorded ‘as live’ each day at 6pm in a converted studio at a central London location, and broadcast at 10pm. Bishop said: “The Nightly Show is a great concept and I like the idea of doing something completely different for a week. I also like the idea of the rotating hosts and following David Walliams means I can have all the beauty products he leaves in the dressing room!" The series is stripped over five nights a week for an eight-week run, featuring a different host each week. The famous faces hosting the show during the eight-week run will oversee a mix of topical monologue, studio games, celebrity guests, experts and video. Executive producers are Andrew O'Connor, Katie Taylor and Lee Hupfield, and the show was commissioned by Peter Davey, ITV's Head of Comedy Entertainment.